This Summer I became part of a group of dedicated individuals from right here in the Cowichan Valley who pulled together to form a troupe, or “crew” I guess you’d say, of fundraising “Privateers”. Now, Privateers are not Pirates. Privateers are authorized to loot and pillage in the name of the King or Queen and in this case, it’s in the name of the BC Children’s Hospital Foundation. Of course, we’re not talking real Privateers but ones who have fun, dress up, maybe drink a Bit ‘o Rum from time to time and engage in things of a piratical nature all with the aim of raising money for a hospital that specializes in caring for sick children. Why this charity? Well, although it’s in Vancouver and not in the Cowichan Valley, it does strike a person chord with many of us that’s “close to home”. My own personal experience stems from my son, Erik, who at 10 days of age, received lifesaving heart surgery at Children’s. While virtually living there for nearly a month and with subsequent annual follow ups, my wife and I really did see the importance of this amazing place and the high level of care given to so many sick kids from all over BC. One of our crew, Darcy Baxter, is a Boy Scout Leader in Cowichan Bay and one of his “cubs” had to have surgery at Children’s as recently as this summer. Gary and Nadine Newcombe, also Privateers, have twin daughters, one of whom as a pre-teen had to have a kidney removed at Children’s Hospital. Another of our troupe has a niece who was treated for Leukemia at Children’s and it’s actually incredible as you tell your stories how many in the Cowichan Valley have been touched by Children’s Hospital. Why Privateers? The truth is I hosted a Pirate Party for my 50th birthday and had too much fun! 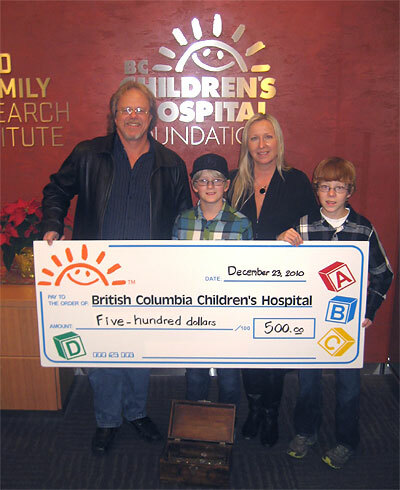 We decided to put out a treasure chest to fill for BC Children’s Hospital and we did…over $500! I noticed that while we were play acting out pirate roles, most people lost their inhibitions and just had fun…and guess what…that works incredibly well for fund raising activities! I suspect that there’s a wee bit ‘o pirate in all of us. with the longboat, wining 2 first place ribbons and raising over $2,000. Other inaugural fundraising events included the Cowichan Bay Regatta and the Victoria Classic Boat Festival. All totaled, $5,000 was raised for the BCCHF and presented to the hospital on October 9th by myself, Captain Kidd, and new member, Captain Jack Sparrow (Denise Pearson). It was our first year and it’s been a lot of fun! Next year’s goal is to raise $10,000, attend more maritime themed events and create a website. Our troupe and longboat is for hire and should there be an opportunity to fundraise, we’d like to hear about it. We’d also like to hear about any Cowichan Valley connection to BC Children’s Hospital stories you have and want to share. I know there are a lot of important and worthwhile charities out there but I have been involved with Children’s Hospital now for 20 years through my affiliation with RE/MAX whose official corporate charity is Children’s Hospital so “It’s a pirate’s life for me”. You might know some of our Privateers, here’s our crew list: Jeff Arndt, Darcy Baxter, Arloene Burak, Randy Lewers, Ken MacPherson, Gary Newcombe, Natacha Newcombe, Dave Newcombe, Denise Pearson, related children and Privateer supporters including Gord Pollock….oh yes and of course me, Kim (Capt’n Kidd) Johannsen.